healthy eating lifestyle that doesn’t break the bank. A fast-food cheeseburger costs about $1. For the same amount of money, you could purchase more than four pounds of carrots, ten apples, or two pounds of sweet potatoes. Americans can use a seasonal food guide to find out what’s in season nearby before planning a grocery list. Shop at farmers markets. 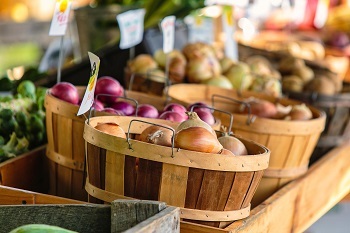 The food at farmers markets is often priced lower than supermarkets and grocery stores. 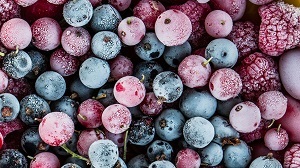 Use the online tool from LocalHarvest website and the online directory of farmers markets from the USDA to search for one in your area. Many farmers markets across the U.S. accept SNAP benefits (formerly known as food stamps) at double the value. 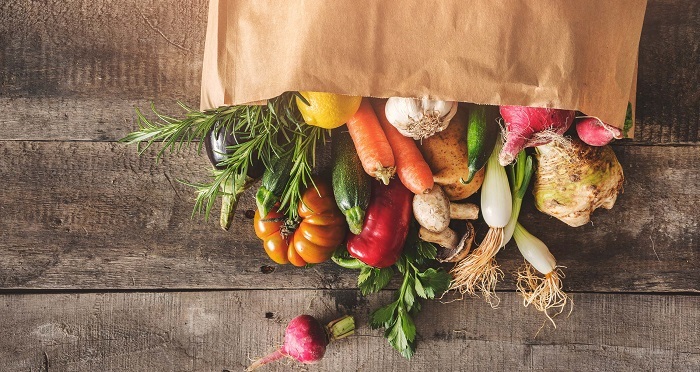 And here’s a tip: If you can be a little flexible on which items you get, try shopping towards the close of the market because farmers may discount items or give you deals. You can ask if they have any “end of market” specials. Join a CSA. Community supported agriculture programs (CSAs) allow you to purchase seasonal produce directly from local farmers. If you’re in the U.S., you can get information on CSAs and find ones near you from the LocalHarvest website. Pick your own. 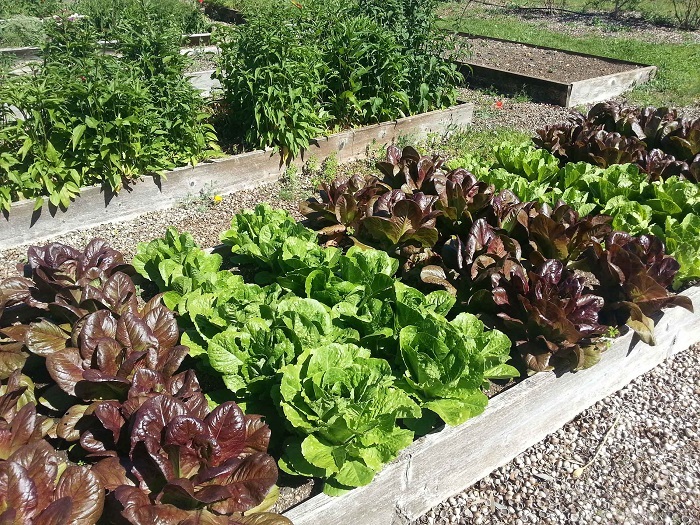 Research if there are any farms in your area where you can pick your own fruits and vegetables. Use online tools to find pick-your-own farms in your area. Sweet Potatoes: This super source of vitamin A grows easily in diverse conditions, so it is often grown free of pesticides. Sweet potatoes can be used in both savory and sweet dishes year round. 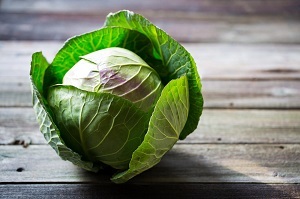 Cabbage: One of nature’s best cancer-fighters, cabbage is a powerful anti-inflammatory that’s rich in vitamin C and affordable all year round. And purple (or red) cabbage has the highest levels of antioxidants per dollar. Cabbage is nutritious and delicious raw, cooked, or juiced (the gas-free way to eat it if cabbage creates flatulence issues for you). Zucchini: This plentiful summer favorite is vitamin-packed and nutritious. It’s mild flavor, affordability, and low score on the glycemic index make it an easy staple to keep around the house. Use a spiralizer to make zucchini pasta or cut zucchini into slices and use them instead of crackers. Carrots: In addition to being good for your eyes, these well-known veggies are one of the richest sources of carotenoids. Regular intake of this natural pigment is linked with an up to 50% decrease in many types of cancers. 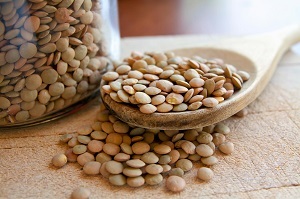 Lentils: These small but mighty legumes are 26% plant protein. One cup of cooked lentils gives you 18 grams of protein. And they’ve been a valuable part of diets around the world since the early days of farming. 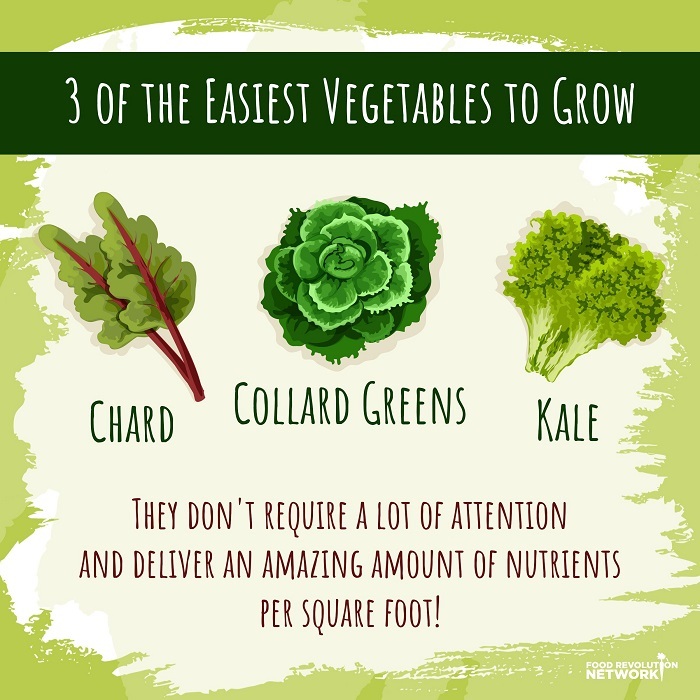 They’re also rich in iron, fiber, and B vitamins. Split Peas: These nutritionally powerful legumes are an excellent source of protein, as well as several important minerals and B vitamins. A single cup of cooked split peas provides 65% of the daily value for fiber. Quinoa: This potent ancient pseudo-grain has as much calcium as a glass of milk and is much easier to digest. It also cooks quickly and is ready to serve in less than twenty-five minutes. Use it in hot casseroles, soups, stews, stir-fries, or cold in salads. Oats: These grains have more protein and fiber than any other cereal grain, and they contain essential vitamins and minerals. Make your own oatmeal using rolled oats in about 10 minutes, rather than buying instant oatmeal or sugar-packed, ready-to-eat cereals. Flaxseed: Is one of the world’s oldest, healthiest, and least expensive superfoods. In fact, flax was one of the original “medicines” used by Hippocrates. John Robbins recommends grinding a few tablespoons in a designated coffee grinder (which is used only for this purpose) every few days and keeping the meal in the refrigerator. You can sprinkle ground flax meal on oats and salads, or mix them into smoothies or casseroles. Sunflower Seeds: Long a staple food for Native American tribes, sunflower seeds are one of the plant kingdom’s most abundant sources of vitamin E, which has anti-inflammatory effects and neutralizes free radicals, thus protecting brain cells and cell membranes. They make great, easy, healthy snacks. But they can also be used as garnishes or ingredients in many recipes. Popcorn: Surprised to see popcorn on this list? 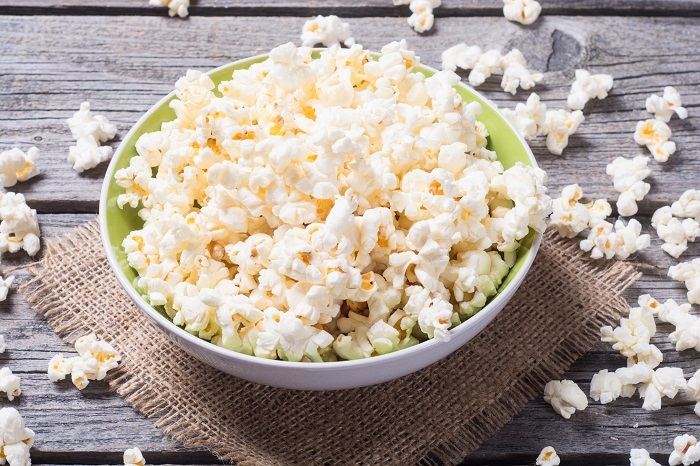 Commercial popcorn is loaded with large amounts of fat, sugar, and salt — definitely not healthy! On the other hand, air-popped popcorn is an inexpensive, whole-grain product that is low in cost and high in nutritional value. You can pop your own popcorn using an inexpensive air popper. Important note: It’s not a good food to serve children under the age of four because of the risk of choking. Nutritional Yeast: With its distinctive nutty, cheesy flavor, nutritional yeast is cultivated specifically for its nutritive value. It’s an excellent source of protein, with all the essential amino acids, and an excellent source of B vitamins, too. Use this ingredient in many ways — as a flavoring and thickening agent in soups, sauces, salad dressings, “cheesy” spreads, casseroles, and more. These protein-packed, cancer-fighting superstars balance any diet, freeze well (once cooked), and keep in the fridge for a week if you salt them. Here’s a tip: VitaClay makes a rice cooker out of clay — so you can steer clear of the non-stick options. Indoor gardening is another idea to help you grow an indoor salad garden year-round. And if you do have more space, try to start growing your own food. 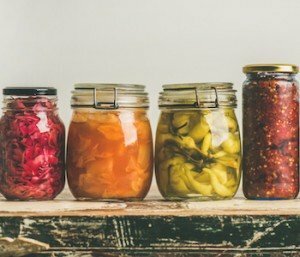 Fermented veggies contain antioxidants, live enzymes, and lactobacillus that improve gut health. 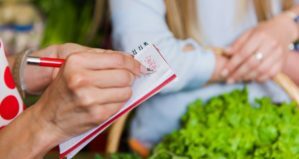 Even one less ingredient on your grocery list means you’re saving money. In addition to growing some of your food, making more food items on your own can save you money and be fun. On the other hand, canning takes a little more time and effort. But it can be a great way to save money. Other products you can make yourself to save money are nut and seed milks. These are easier to make than you probably think. Making your own vegetable broth from food scraps is a great way to save money and reduce food waste at the same time. And if you want to be a little extra adventurous, you can even buy a starter and make your own homemade nut yogurt. You could easily make cashew cheese sauce, broccoli cashew bisque, cashew-based salad dressing (leave out the maple syrup if you want to avoid sugar,) and cashew sour cream in one afternoon. Homemade sauces, like teriyaki sauce (find a gluten and sugar-free version), can be made for a fraction of the cost of store-bought varieties. Feel free to pass along these healthy eating secrets! Some secrets are meant to be shared. What are your favorite ways to save money while eating healthy? 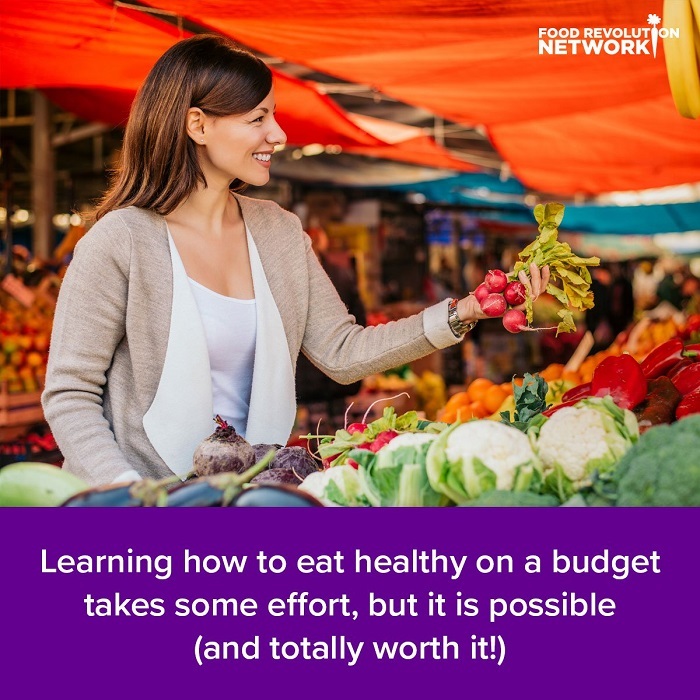 What tips can you share to help others learn how to eat healthy on a budget? And if you’re inspired, please SHARE this article. Together, we can work for healthy, ethical, sustainable food for all! Thanks for asking and yes you can use a portion or all of this article, especially if you link back to our website. Nice read, I just passed this onto a friend who was doing a little research on that. And he just bought me lunch as I found it for him. So let me rephrase that: Thank you for lunch! “Dreams are real while they last. Can we say more of life” by Henry Havelock Ellis. Well I truly liked reading it. This post procured by you is very practical for good planning. I was looking at some of your blog posts on this site and I think this website is rattling instructive! Keep on posting. I have been reading some of your articles/blogs and they state pretty clever information. I will make sure to bookmark your blogs. Hey! I know this is sort of off-topic but I needed to ask. Does building a well-established blog like yours take a massive amount work? experience and views online. Please let me know if you have any ideas or tips for brand new aspiring bloggers. Appreciate it! Hi, I do believe this is a great website. I stumble on to it 😉 I am going to come back yet again and have now book-marked it. Money and freedom is the best way to change, may you be rich and continue to guide other people. Excellent post. I just read this blog and I’m impressed! Extremely helpful info specially the last part 🙂 I care for such information much. I have been seeking this particular info for a very long time. Thank you and good luck. That is a very good tip especially to those new to the blogosphere. Brief but very precise info… Appreciate your sharing this. A must read article! Hi there to everybody, this is my first visit to this website. This article has amazing and truly excellent information designed for readers. After going over a handful of the blog posts on your website, I truly like your way of writing a blog. I have bookmark your webpage list and will be checking back in the near future. Please visit my web site as well and let me know your opinion. Hi, i think that i saw you visited my blog thus i came to “return the favor”. I’m attempting to find things to improve my site! I suppose its ok to use a few of your ideas!! My brother suggested I might like this blog. He was totally right. This post actually made my day. You can’t imagine simply how much time I had spent for this type of information that was presented in this post! Thanks! It’s really a great and helpful piece of information. I am happy that you simply shared this useful information with us. Please keep us informed like this. Thanks for sharing. I’ve been looking for a plug-in like this for quite some time and was hoping maybe you would have some experience with something like this. Please let me know if you run into anything. if all website owners and bloggers made just the right content as you did, the web will probably be a lot more useful than ever before. acceptable deal. I had been a little bit acquainted of this your broadcast provided bright clear concept. Have you ever thought about creating an ebook or guest authoring on other websites? I have a blog based upon on the same topics you discuss and would really like to have you share some stories/information. I know my readers would value your work. If you’re even remotely interested, feel free to shoot me an e-mail. May I simply say what a relief to uncover someone who genuinely understands what they are talking about online. Thank you for this informative website. Where else may a person get that kind of info written in such a perfect method? I have a venture that I’m working on, and I’ve been at the glance out for such information. I blog often and I seriously thank you for your information. Your article has truly peaked my interest. I will take a note of your blog and keep checking for new details about once a week. I opted in for your Feed as well. For the reason that the admin of this website is working, no doubt very shortly it will be famous, due to its feature contents. Do you know how to make your site mobile friendly? My weblog looks weird when browsing from my iPhone. I’m trying to find a theme or plugin that might be able to correct this problem. If you have any recommendations, please share. Thanks! It’s really a cool and useful piece of information. I’m glad that you simply shared this useful info with us. Please keep us informed like this. Thank you for sharing. I know this if off topic but I’m looking into starting my own weblog and was curious what all is needed to get setup? I’m assuming having a blog like yours would cost a pretty penny?